PYEONGCHANG, February 25, 2018 – South Korea bid farewell to athletes from around the world at the PyeongChang Olympic Stadium tonight in a spectacular closing ceremony to conclude the Olympic Winter Games PyeongChang 2018. Towards the end of the ceremony, Thomas Bach, President of the International Olympic Committee (IOC）handed the Olympic flag to Chen Jining, Mayor of Beijing, marking an important milestone in the preparations for the Olympic Winter Games Beijing 2022. 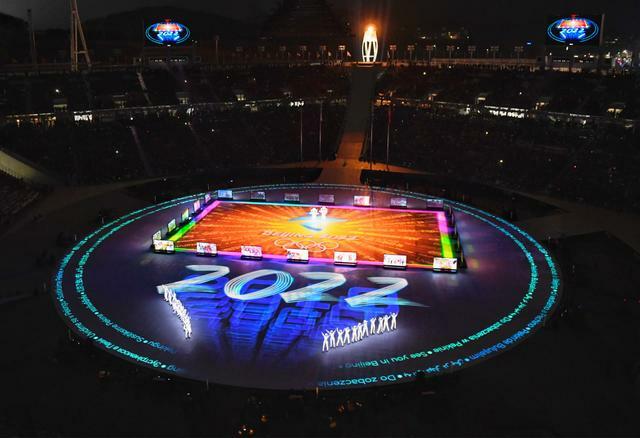 Beijing 2022 then put on a short artistic performance under the theme of ‘See You in Beijing in 2022,’ directed by world-renowned film director Zhang Yimou, who also directed the opening ceremony of the Beijing 2008 Summer Olympics. The show centred on the talents of a group of 24 roller-skating performers from Beijing Sport University, the number 24 representing the XXIV Olympic Winter Games to be held in Beijing. The performers skated together in perfect formation wearing specially-designed clothing covered from head-to-toe in LEDs. Led by two performers dressed as ‘Panda Captains,’ the remaining 22 were joined on the centre stage in an interactive, synchronized performance by 24 transparent, high-definition ‘ice screens’ mounted on ‘automated guided vehicles’ (AGVs). The performance delved into China’s ancient past, tapping into the country’s rich cultural heritage while also paying tribute to the present, as well as the future that lies ahead. In addition to references to traditional elements including the Great Wall and auspicious mythical animals like the Chinese long (Chinese dragon) and the Chinese phoenix, the performance also showcased China’s recent engineering and technological feats, such as its extensive high-speed rail network and its space program. Towards the end of the performance, the Olympic rings appeared on the stage, as well as images of a global village, smiling children’s faces, olive branches and plum blossoms, symbolising China’s commitment to promoting global peace and building a better future for mankind. Finally, the skaters travelled a path to draw the ‘Winter Dream’ emblem of the Olympic Winter Games Beijing 2022. The show concluded with the transformation of the centre stage into an Internet data tunnel and the ‘uploading’ of the ‘Panda Captains,’ who then appeared as cuddly ‘Panda Messenger’ avatars on the overhead screens before travelling through the tunnel to Beijing and other places in China, collecting invitations for the world to come for Beijing 2022 in four years’ time. The ‘Panda Messengers’ returned through the tunnel to the PyeongChang Olympic Stadium with a large envelope, which opened to display pictures of Chinese people who had sent their messages of goodwill and invitations to the world. In a news conference at PyeongChang 2018’s Main Press Centre on Saturday, February 24, Chang Yu, Director of Beijing 2022’s Media and Communications Department, congratulated PyeongChang 2018 for staging a successful Olympic Winter Games and thanked his Korean colleagues for providing Beijing with great learning opportunities. Chang told reporters that preparations for the Games are progressing well on all fronts. He noted that venue construction is on schedule and many legacy venues from Beijing 2008 will be used for Beijing 2022, while all new venues will be built with sustainability in mind. Chang said that Beijing 2022’s engagement plans to promote Olympic winter sports in China have seen great progress, with the ultimate goal of encouraging millions of people, especially the youth, to embrace winter sports and be inspired by the Olympic spirit. Beijing is well on its way to deliver “Green, Inclusive, Open, and Clean” Olympic Winter Games in 2022 and there will be a great Olympic legacy for China after the Games, he said. The Olympic flag is scheduled to arrive in Beijing on February 26, with a series of events – including one at the foot of the Great Wall – planned to welcome the flag once again to the Chinese capital.